The Tab S I got as a test unit came with the bluetooth keyboard and makes a very nice (albeit) expensive alternative to a notebook. I'm kind of surprised at how appealing this set up is to me. 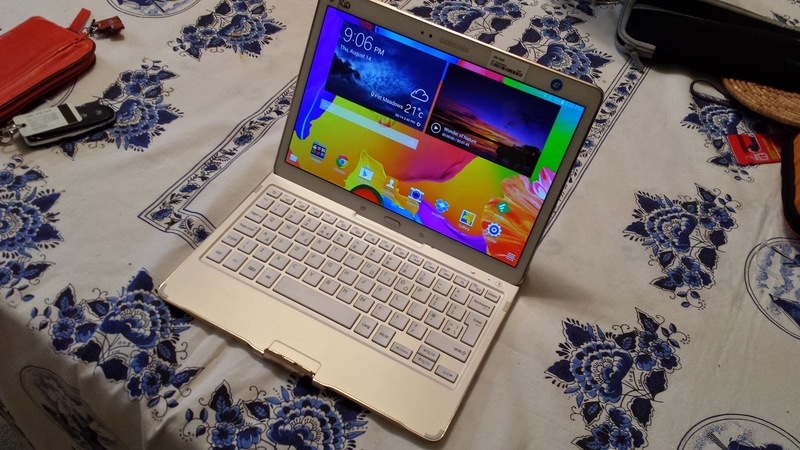 The screen is very crisp, the battery life goes on forever and the keyboard is very functional, both in terms of key size and as a cover for the tablet screen. I've gotten used to having a touch screen on my main desktop computer so it's not that foreign to be touching the screen, with the keyboard this really doesn't feel like a tablet. The outside finish is soft and grippable yet cleans easily. As many reviewers have stated you either love the vibrancy of the AMOLED display or you don't. I happen to love it and really notice when I place the Tab S next to the Tab PRO I purchased earlier this year. The PRO just looks washed out even with the adaptive display. With the 10.5 there is plenty of room for multi-screen use and it can be very handy, whether you have 2 versions of the same app open or just want to browse while watching YouTube. I've settled on the 8 inch as my tablet size of choice and using this larger tablet shows either some games just aren't meant to be played on a tablet as they do just look like big phone games. Utilities like Evernote do a great job of using the screen space though. And what about the keyboard? It's rechargable and will not run out before the tablet does. The keys have good travel and spacing. The shift for the 2 and ' keys are stenciled incorrectly so if you don't know where the @ and " should be you'll be confused - pretty big QAQC failure for a mundane object. But there are lots of useful function jeys and since it's bluetooth you can connect it with any other device with a BT reciever. After a week of switching back and forth between my Tab S 8.4 and the 10.5 test unit I'm very impressed with the 10.5 mostly for battery life. Since I'm on vacation I'm using the tablet for browsing pretty well all day. Since I don't play a lot of games, a charge will last a couple days (it also takes a longer time to recharge of course). I use my tablet mostly in portait mode because I read a lot so the button and speaker placement is a little less convenient. I was happy to say at this resolution there is absolutely no graininess, I was surprised to notice how picky my S4 made me:) If I used my tablet mostly for video viewing and document creation this would be my setup of choice. I wrote this review using it in a blogger window and it was a surprisingly great experience. I didn't talk about touchwiz because I didn't really set it up. The widget options are great but not part of my regular use.